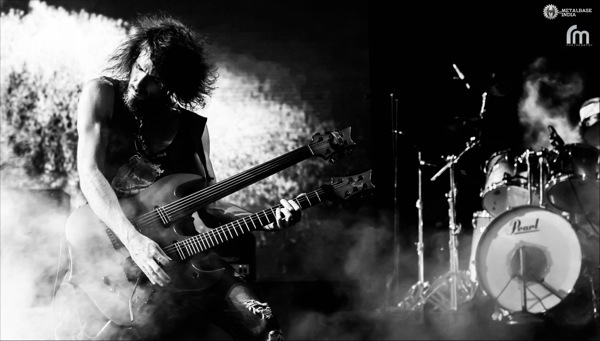 Aside from being primarily known as a member of Guns ‘N Roses and lending his musicality to that band on stages all over the world for the past eight years, guitarist Ron ‘Bumblefoot’ Thal also has an accomplished solo career under his belt, which he’s currently attempting to revive by being part of the ‘Guitar Gods’ North American tour with Yngwie Malmsteen and Gary Hoey. His most recent solo material was released in 2011 and he’ plans to work on new music very soon. On June 25th, I did a phone interview with him to discuss Guitar Gods, the new music, and just about all other things Bumblefoot. Enjoy the conversation below and LA/OC folks can catch his solo act live at the Observatory in Santa Ana tonight (7/02) and/or tomorrow (7/03) at the Saban Theatre in Beverly Hills. Bumblefoot, it’s great to have you on Metal Assault again. It’s been a while! So, you’ve been doing this Guitar Gods tour. How’s everything been going for you? It’s been really cool! Me and my band, and Gary Hoey and his band are all on this wacky vehicle driving all over the country, just throwin’ and goin’. You get to the venue, you’re loading, you get your stuff open. So it’s very ‘real deal’ rock ‘n roll. I don’t know how else to describe it. It’s something I’ve kind of missed! Doing all the GNR stuff and having everything taken care of and never having to really touch your gear or do a damn thing, compared to having ten minutes to get your stuff set up and get it right, hit it and just blast it .. feels good! (laughs) I feel alive, I feel alive. And it’s nice to be playing my own music as well. It’s something that I should have been doing all along and should have never stepped away from it so much. I should have been nurturing it a lot more over the last eight years. It feels good to be doing that again and building that back up. Right, so what exactly have you been doing in these shows? Is it just your own music through the entire set? Yeah, I don’t know if a lot of people know this, but I have over 20 years of music released, a lot of albums going back to the Shrapnel records in the mid-90s, and everything I’ve put out now. I think it’s sort of got dwarfed by being in Guns ‘N Roses. Once you join that band, it sort of erases and squashes everything else and it just becomes like, “Oh, he’s the guitarist of Guns ‘N Roses!” People don’t even know that I’ve been singing, writing, recording, releasing, touring and doing everything for over 20 years. So I’m doing all my own music and I’m in the middle of working on a new album as well. I’ll definitely get that out this year and then I’ll hit the road again to share all that newer music with everybody as well. I was going to ask you about that. So we can expect a new album this year, then? It’s been a while since you released any new music of your own, right? It has been, yeah. In 2008 I put out ‘Abnormal’ and the acoustic album ‘Barefoot’, and I was never able to collect the momentum to do a full album. It takes a lot of time and focus aside and it was just not possible with all the touring and everything else I was doing. So in 2011, I put out one song every month, and did it for nine months. Each song would have backing tracks, guitar transcriptions and mixing stems so that people can make their own versions of the songs. It was good to be able to do that and I was able to pull off nine little bites, whereas if I tried to take on a whole album it never would have gotten done. But now I’m really setting aside the time. Other than this tour I’ve been pretty much saying No to everything else, every other tour, and I’m just going to focus on getting new music out. That’s what I need to do. That’s good to hear, man. Coming back to this tour that you’re doing now, it’s called Guitar Gods, which is a cool name but in many ways it is kind of pretentious, calling oneself a guitar god. In that sense, how does it feel to be part of this tour? (Laughs) Well, I did not come up with the name. I mean, this is a creation of Yngwie and April Malmsteen, and it’s something that they’ve been working on and wanting to put together for a long time. It’s their name, their creation and it’s great that they chose me and Gary Hoey to be part of it. It’s an honor and it’s very flattering to be coming from a legendary guitar player, who is a guitar god, to want to include me on that. Do I consider myself a guitar god? More of a guitar dog, if anything (laughs). I’ve never seen myself as anything more than a guy who’s a musician that just loves making music. It’s that simple. No other titles or names to it or anything like that. Just a guy that likes playing guitar! Right, exactly. It’s cool though that this kind of tour is coming back, because the G3 tours used to happen many years ago with Joe Satriani, Steve Vai and all those people. That went away, at least from America, so it’s good to have something like this now. Yeah, it’s nice to have something for guitar players, but at the same time, it’s really for anyone that likes rock, blues, metal and guitar-oriented music, but everything we’re doing is also vocal music. None of us are doing all-instrumental. Gary sings, I sing, and Yngwie’s band’s keyboardist is an incredible singer, the bass player as well. He’s got a phenomenal band, really cool dudes. It’s something that’s definitely guitar-oriented, that’s for sure. You might lose count if you try to count the notes (laughs). But it’s nice to see something out there specifically for guitar players. Hopefully it’ll just keep on going, and hopefully Yngwie will take the Guitar Gods idea all around the world and keep it growing. In terms of your singing, how much do you think you’ve grown as a singer over the years? Recently I saw you play the role of Paul Stanley in an all-star KISS cover band at the Whisky. You did an amazing job with that. (Laughs) Oh, thank you. Yeah, that was with Rex Brown from Pantera/Kill Devil Hill, Mark Zavon from Kill Devil Hill and Brian Tichy from Whitesnake and a million other amazing things he’s done. We’re all KISS fans, and we had recorded music for a fundraising album that Mitch Lafon, a journalist from Canada had put together to raise money for cancer-related causes. So we recorded songs for that and then people said, “Hey, when are you going to do this live?” So we did, we got together and did a couple of gigs in Vegas and at the Whisky in LA. But yeah, I’ve been singing my whole life. Being in Guns ‘N Roses and watching Axl has definitely helped. Seeing that guy running around the stage and singing at the top of his lungs for three hours straight is something that boggles my mind as to how a human being has the energy to do that. But he does it! I learned a lot just by listening to him and really paying attention to what he’s doing technically, where he’s breathing and where he’s relaxing, just letting things resonate and getting all geeky and technical about it. And it definitely helped me with what I’m doing. Everything you do in life, you grow from it, you learn from it and you get better from it. You were telling me a couple of days ago that during this tour you’ve also been doing a couple of clinics at Guitar Center and places like that. 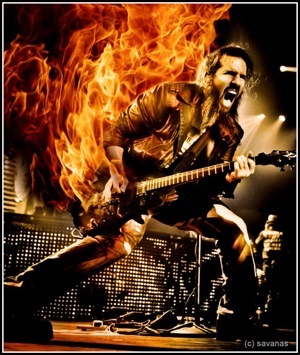 What’s a Bumblefoot guitar clinic like? Do you try to just keep it light-hearted and entertaining or is it very instructional? Well, the stuff on this tour has been mostly just meet ‘n greets where we do Q&A, photos and autograph sessions and things like that. But when I’m doing clinics, which I just love doing, I sit on a chair with a mic in front of me, a guitar plugged in and an iPhone full of backing tracks. It’s very spontaneous, it’s fun, it’s a lot of back-and-forth with the audience. I play songs, I talk a little bit, I take a lot of questions, there’s a lot of joking around and usually someone would just call out a random song and I’d just start playing it, and things like that. These clinics tend to last up to six hours, and when people agree to do these with me, they’re like, “Ok, it’s going to be from 2 to 4”. But I’m like, “No, it’s going to be from 2 to 8. Trust me, be ready.” I don’t rush people when they want me to sign things and talk. I give everybody their time and make them feel as welcome as they truly are. It’s an event, a whole day of hanging out and having a good time together. So yeah, I’ve been doing this all over the world, all kinds of places that I’ve never been to before, from Malaysia to Indonesia to Albania, Tunisia, Belarus, Copenhagen, Israel, all around Europe, Argentina, Brazil, everywhere. And it’s a hell of a lot of fun. That’s awesome. In these clinics, as you said, I’m sure people ask you to play a certain song. Are you always ready for random requests? Oh, sure! I love being surprised and challenged like that when someone goes, “Play this song!” I’m reaching to the back of my brain and trying to remember it. I’ll start singing it and playing it and screwing it up all over the place when I don’t remember the words. But it’s all in good fun. But when it comes to playing covers like you did for the KISS thing, how much do you have to practice for that? Do you already know everything, or do you still need to work on stuff? You always need to stay on top of your game, keep your chops up and keep your brain fresh, and stay reminded of the little details and nuances of something, but it’s something that you grew up on and it’s in your blood, like KISS, Led Zeppelin, Priest, Maiden, Ozzy, The Who, Beatles, AC/DC, Sabbath. All that stuff is so ingrained already into your head that you can just play it for the first time and it’ll sound like you’ve been playing it all your life. And finally, what plans do you have after this tour? The immediate plan when I finish this Guitar Gods tour is to get back in the studio and finish up the new album as quickly as I can. As soon as that is done or is getting close to done, I’ve got to work on the best plan for releasing that thing, with videos or things that really connect to fans and anyone interested in it. I want to get out and tour the world a hundred times over, as much as I can. Coming up with a good way to share it with the world, that’s what I’ve got to do next, and I’ve been saying No to most of the tour offers that I’ve been getting for the rest of the year, because I just want to devote my time, once and for all, to being in the studio, writing music and getting it out. So I’m working on that. I have a few one-offs here and there that are coming together. I might be going to Dubai in August, just for a quick week for the launch of my hot sauces out there. We have an exclusive distributor who’s going to be spreading it around the Middle East and I’m going to be there for the launch. But yeah, the plan really is to get in the studio and to not make any other plans until it’s time, until I’ve done what I should be doing, which is being creative and getting new music recorded. That’s great, and all the best with that. We’ll be looking forward to the new album and everything. Thanks for your time! I’m glad we got this interview done, and I’ll hopefully see you at the Guitar Gods LA show. Absolutely! Looking forward to seeing you very soon. Thank you so much for putting up with my crazy schedule (laughs).